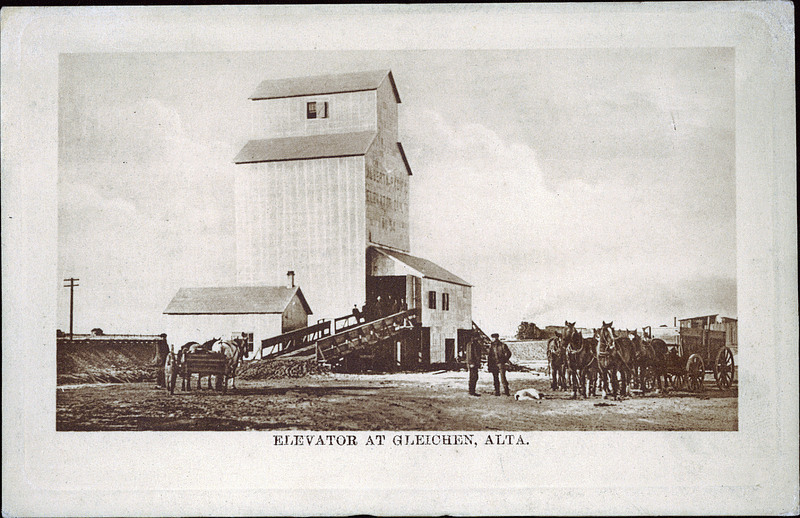 The University of Alberta has a on-line archive of documents and photos, they 18 photos showing Gleichen and related pictures in the early days. 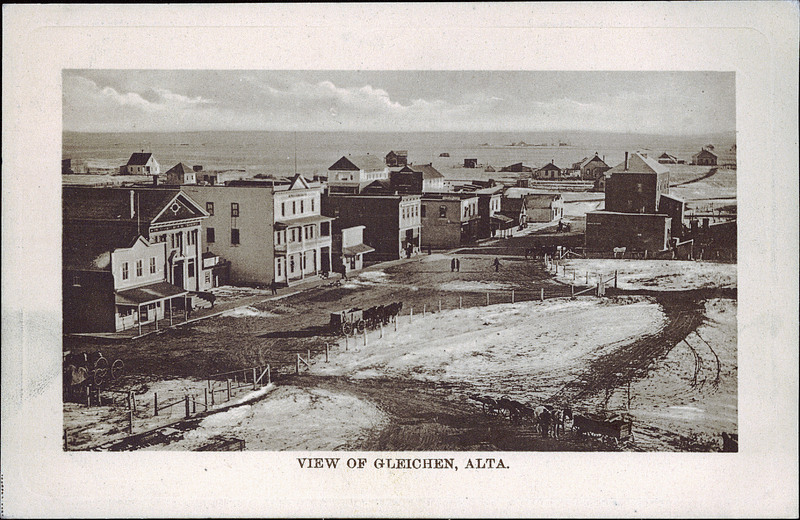 Here are some of the ones that show Gleichen in it’s early days. If you look in the above photo to the left you can see old CIBC building set back from the rest of the buildings (a bit of roof is showing). Currently this building houses our community Library. The best guess is that this photo was taken post World War I but prior to the big fire of 1920. 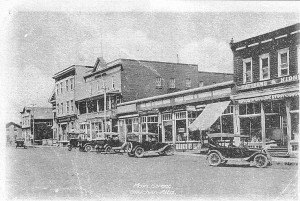 The Model T’s in the photo have side doors which indicates post 1915 and were not common till post 1917. 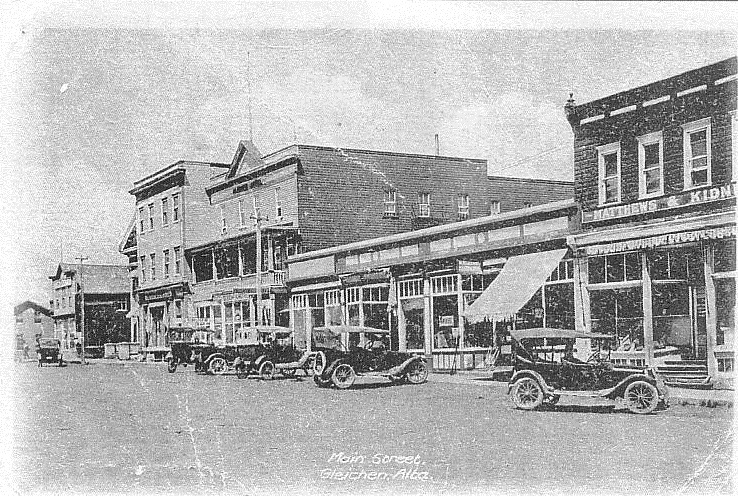 One of the post cards from the U of A shows the same street (main) as above but looking from the opposite direction. It was taken in 1909 and the Library/CIBC building is clearly visible in this one. Some of the buildings changed in the time between the two pictures. Notice the small building between the library and the 3 story hotel to it’s right (in this picture) it goes from a small building in this one to a large 3 story building in the later one. That new building was a Royal Bank of Canada. Also on the right is the three story Larkin Block building. Another 1908/9 image shows more of the town to the west of the previous picture. The roof of the library building can be made out in the bottom right corner. Central to the picture is the Anglican Church which is one of the oldest buildings in Gleichen. 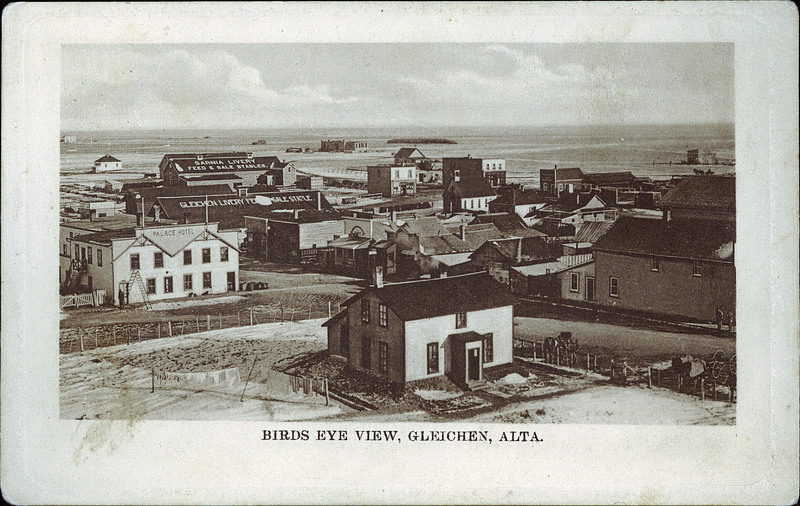 Also the Palace Hotel is being renovated in this picture and the Gleichen Livery Stable is located on the site the current County of Wheatland shop occupies which at one point also housed the arena. The Elevator in the above picture was used to take the previous aerial photos. The CIBC/Library building can be seen clearly in this picture as well as the Royal bank building to it’s right. Many of the people watching the parade are standing on the balconies of the Gleichen Hotel which burned down around 1920, it was replaced by the Queens hotel which in 1948 charged a dollar a night and which itself burned down in 2001. 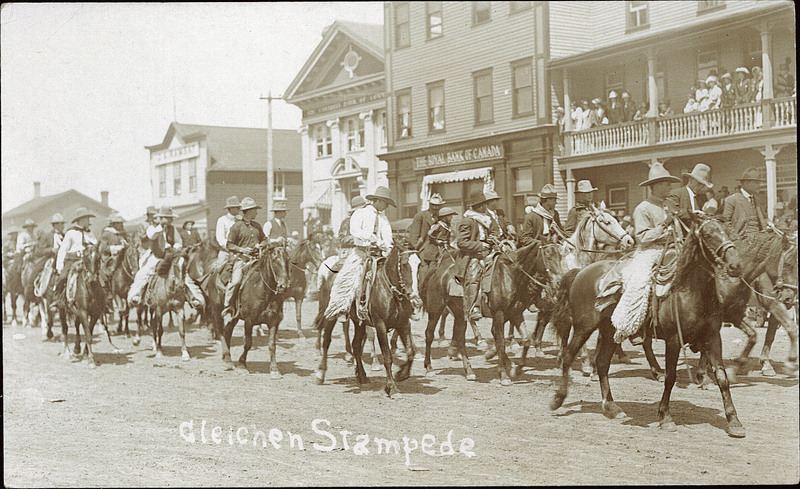 This picture was taken during the 1915 Rodeo. This 1911 image is looking to the Northwest of the elevator and shows many of the houses in town at that time. This image of the Palace Hotel was taken in 1910 a year after it opened in 1909. 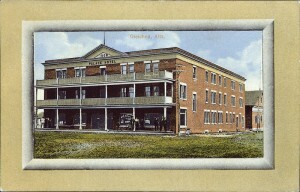 The hotel was located on the land across from the current Community Hall / Legion building (ie the hall parking lot). In 1916 the rates where 50cents for a meal, 75 cents to a dollar for a first floor room and 50 cents for a second floor room and the whole hotel is listed as having steam heat. 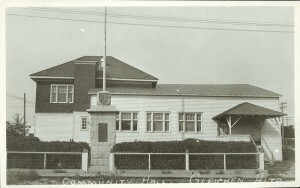 The community hall in 1930 was located where the post office is currently located as this photo shows the cenotaph in front of it. 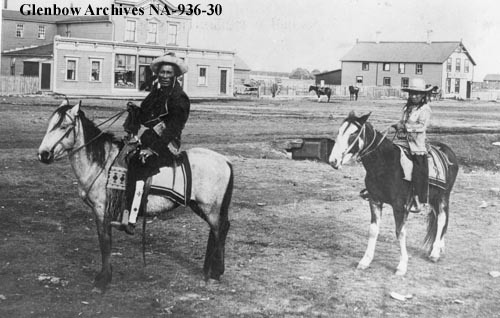 Wolf Head and son riding down main street in the 1880’s. 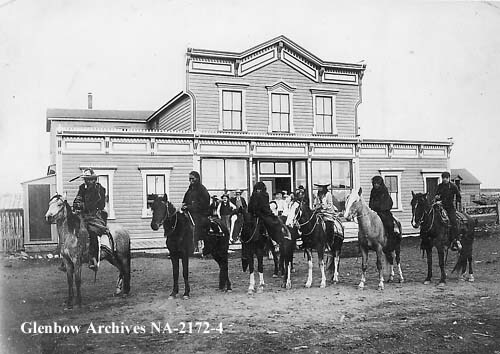 A different group of Blackfoot men on horseback in front of the same building in the 1880’s. 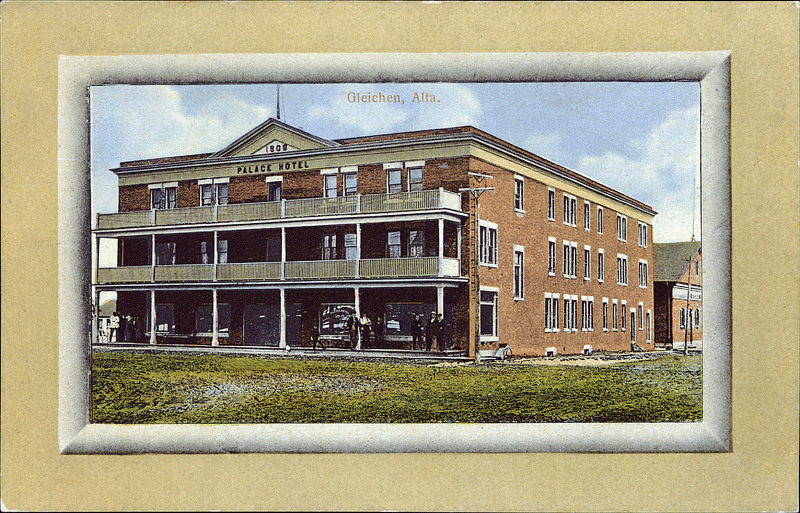 Three postcards published by the Gleichen druggist A.R. 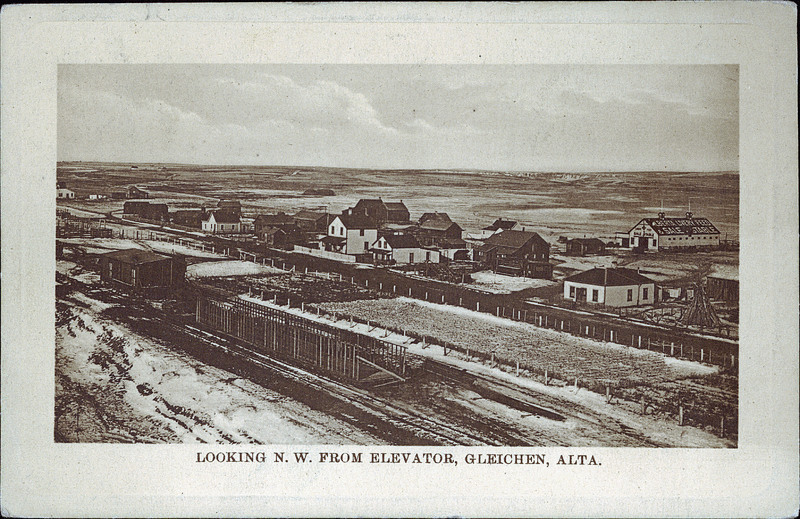 Yates in 1905 show life around Gleichen. The first is of Cattle being dipped and the second shows a Horse ranch with 1000 horses, the third shows cattle being branded. A 1920 post card shows a Altman Taylor harvesting machine in action. The 1925 Calgary Stampede saw Slim Moorehouse pull 10 wagons of wheat with 36 horse from Gleichen to the Calgary Stampede. 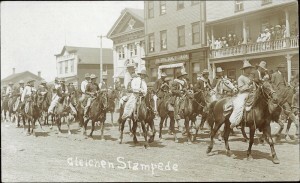 This image of the team was taken along the route, the suspicion is it was taken in Calgary. A 1907 postcard showing an Indian Encampment. A 190? postcard shows a native lady with her baby in a Papoose. A post card from the early 1900’s shows a native women and a horse. A 1907 postcard shows a Metis camp near Gleichen. This is a wonderful website of the History of Gleichen, with the great old photo’s. I Have lived in Gleichen for 10 years, and still go touring around the historical sites with my family and friends who visit. I don’t think that many people are aware of how interesting of an historical place that Gleichen is. I would love to see any old photo’s of the hamlet’s housing estates, especially mine. How would I be able to find some? I find the Glennbow archives online and the UofA archives are both great sources. If you look below the old photos on this site you’ll see I included links that take you to the archive it came from. Both of those sources have thousands of old photos but they are only sorted by community; so you’d have to look at each one to see if it is of your place. I don’t have the links handy (on my cell) but look on the site at the various links. My family lived in Gleichen in 1960’s and both my parents and brother are buried in the local cemetery. I have viewed the History of Gleichen and viewed the pictures from Gleichen School, which I found my self and siblings in. It was a pleasure reading this interesting book and look forward to reading the second History Book soon to be published. I remember the Old Folks Home on the north end of town, it was abandoned and derelict when I was young we spent many an afternoon scaring the hell out of each other in that place. How scary was it? There was a old wheel chair in one of the hallways and the boiler room was…. I too remember the derelict old folks home. I was 7 years old in 1968, my first of the three years I lived in Gleichan. I, of course, was not allowed to go there but I remember small groups of us kids would sneak in and scare ourselves to death telling creepy stories. Even in broad daylight, the place was dark enough inside to make us all eventually run screaming outside into the sunlight. Nothing like good-times in a small town for little kids. My father was the minister at the United church who, after only three years got transfered to a church in Calgary. In Google street view, at 207 6 ave, there is a Gleichan Community Church. The building looks familiar although it is definately updated. I think it used to be green shingles or wood painted green. The neighbourhood doesn’t look familiar at all but I was only 7, 8 & 9 years old when I lived there. I’m wondering if the Community Church used to be the United Church in 1968. I definately found my old house though… across the alley from the school; 408 8 Ave. I remember coming home from school every day down the alley. My dog was always waiting for me. That house was new when we moved in; the yard was dirt with weeds as tall as me. My brother and I spent many long hours pulling those weeds. Oh, and I just remembered, my mother was the school bus driver for a while. The bus was huge and was parked in our back yard. Cleaning out the inside was another job of mine and my bother’s.